Thank you for your comments, please keep them coming! You can submit a comment here. We buy each magazine from the Wivey Co-op. It is something we look forward to, having known Exmoor for quite a few years. We appreciate the number of really interesting articles – it is not just something where you find the odd article between glossy adverts. My mother has dementia, and we also find that we can use your articles and photos as a basis for a conversation about what she remembers of her earlier life in the south west. We think that you have a good balance of “nostalgia”, What’s On and really interesting articles about those living and working in the region in the present. And the photos are beautiful too. An all-round high class publication. As an ardent ex pat lover of Exmoor and of your excellent magazine, I would like to congratulate you on publishing the article on the history of Exmoor fields in your Winter issue 2014, so well written and researched by Michelle Werrett. I wanted to say that we think the new (autumn 2014) Exmoor Magazine is brilliant. It’s always been our favourite magazine, but it just gets better and better. I had to chuckle to myself when I saw my three-year-old granddaughter Chloe relaxing in the sun with my Exmoor Magazine; when I asked what she was reading she looked up and said “Bugs n stuff!” When I looked it was the article on ‘Small lives that shimmer’. So you really do appeal to a wide age range. We have been taking your magazine for years and hopefully our grandchildren will be too. I have just received the latest issue of Exmoor Magazine [Summer 2014]. Once again, I am so delighted with the very high quality of the editorial content. Superb photographs and great news interest. Well done to the team. This has to rate as one of the best magazines available today. Just wanted to say a huge thank you for the feature in the latest issue of Exmoor. It looks and reads brilliantly – thank you. I also absolutely love the issue cover. Gorgeous colours and so inviting. I have bought so many copies to send the family and friends I should have made a good boost to your sales figures alone! I have just received my Summer edition of the Exmoor Magazine through the post and in the middle of a difficult day it has really cheered me up. Cracking content and feature rich. A lovely nostalgic walk down memory lane and its simply FAB to see so many adverts of new businesses opening in the park. We stayed at The Culbone recently and it was superb. The Summer (2012) edition of Exmoor Magazine carries the lovely interview with Trevor Beer and it made me reminisce and dig out an early book of his called Tarka Country published in 1983: produced by your own Garden Correspondent, Rosemary Lauder, under the imprint of Badger Books. We always enjoy receiving Exmoor magazine – it’s like an old friend now, full of places we know and love and familiar faces. So, please give our thanks and good wishes to editor Naomi, to Elaine, Heather and Sue and all other members of the team. Many thanks for all the hard work and team effort that go towards giving us an excellent magazine. We look forward to another 12 issues. Beautiful edition of the Exmoor Magazine has just arrived in our post. I’d like to say the magazine just gets better and better, but it doesn’t, it can’t, because it is so good already. Thank you for keeping it alive and well. It’s a deliciously early Christmas present, and will lie publicly on the kitchen table for the next six weeks. I got great feedback from the article thank you so much….. I have had new contacts, playscheme bookings and a party booking so that is wonderful thank you! Just a quick email to say thank you for the piece on the Festival plus refs in the diary in the current magazine – lovely. The magazine is a really lovely publication these days! Well done! A good read and fab photographs. Many thanks. We have just taken over Hele Cornmill in Hele Bay, Ilfracombe and were delighted to see several people visit our tearooms with the Exmoor Magazine article in hand. Thank you so much for including us in the walk. We are a little off the main road so many people (even local) don’t know about us. Please do send the author of the walk down to have tea with us – we do great Devonshire splits, homemade cakes, ploughmans and sandwiches! Thanks again. I’ve just ordered the Summer issue and look forward to reading the magazine. I now have a large spread of work on sale in Dulverton as a direct result of the feature and lots of comments which may well lead to sales in the long term. It is hard to say straight away because the magazine stays around for a long time and has an ongoing appeal and relevance. People hold on to it so the benefits lasts! I like its general permanence. I am certain that the feature will continue to do me good. Thank you so much. Many of my friends said how superb it was. I would like to take this opportunity to congratulate you on the production of a very good country magazine. I just wish to add a few comments regarding the Exmoor magazine. I have been a subscriber for a few years and find every single issue very compelling and interesting reading with special emphasis (as it should be of course) on our local beautiful and interesting moor. 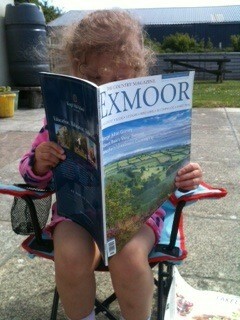 I must also congratulate the editor on editing such a topic and fascinating magazine as Exmoor – The Country Magazine. I believe she is doing a sterling job which, at times, must be quite a challenge, having to come up with relevant articles and historical facts for every issue. I am a citizen of the Netherlands and have never come across such a captivating magazine as Exmoor. Well done and I wish you lots of success for the future. Just a note to say that your magazine is enjoyed here in France, not only by us but also two lots of friends who previously lived in Devon. One lot lived near to Parracombe and the others in South Devon. I have been a subscriber to “Exmoor Magazine” for some years and am a great admirer of the photography and articles in it. I wonder if you would send a copy to [my friends] and any surplus money can go to the English Channel Challenge.